TheRustedChain - The Blog: Nice Melons.... summer style. The other day I went to the store to pick up a few things - milk, a melon, bread, eggs, etc. When I got home my high ticket price was bothering me so I went to look back over my receipt. Then I saw that I'd paid $9 for a melon!! Ack!!! When the sign said $.99 I missed the part that said "per pound". Apparently I'd picked out a 9 pound beauty. Ever seen a $9 melon? Here ya go. Beauty, eh? It's a Crenshaw melon or something like that and basically tastes like a cross between canteloupe and honeydew. But for that price, next time I'll buy a canteloupe and honeydew and mix them in my bowl. The Man told me next time I bring expensive melons into the house they better be wearing pasties or at least fill out a C cup or something. Good idea to mix the honeydew & cantaloupe next time! That sure is a huge melon. Love his comment LOL. I paid a fortune for grapes one time, so now I know to note the price per pound and weigh stuff on the scale so there's no nasty surprises at the check-out. The Man is so funny! 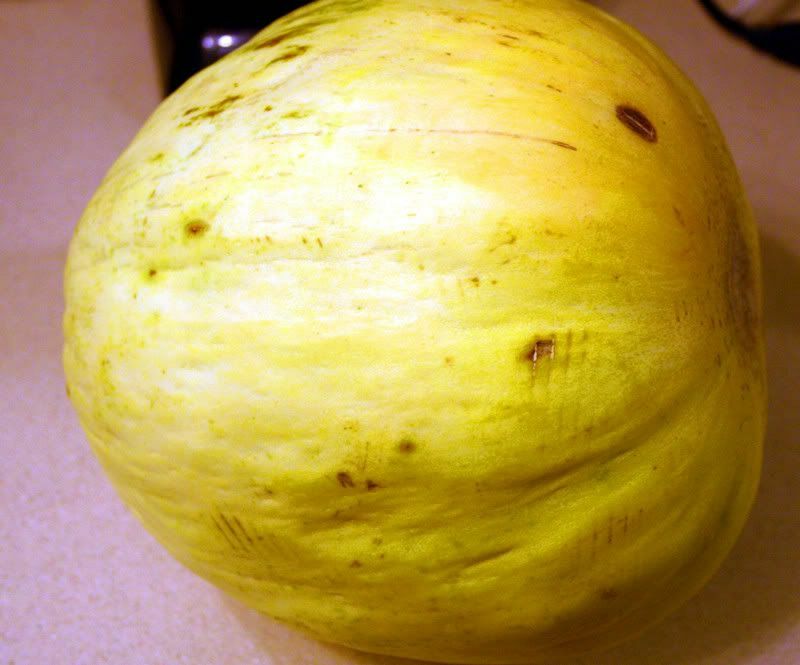 Pretty huge melon though. I bought tons of cherries yesterday because the sign said $1.88 and I didn't notice the per pound part either. Who knew they could fit so many pounds in one bag? lol Pasties!! That's great. :) Nice melon. That's a man for ya. That's a lot of melon. Have you made a dent in eating it all yet? We go through melon here like it's going out of style. What's the inside look like? too funny! the man made me laugh! Hee Hee! Good thing The Man has a great sense of humor. That's one nice melon too! I almost ran into the same thing buying a pumpkin on year. When I realized a tiny little "baby pumpkin" that was going to school to be decorated with markers & paint was going to be about $10, I put it back! OMG $9.00!!! I hope you enjoyed your melon. I'm not sure pasties would have helped! It just goes to show you we need to read between the lines. The Melon is very pretty though. I've done the same thing! But I only paid 7 bucks. It was a shock & a surprise. It makes you eat it differently--as in, you savor every expensive little bite. Crenshaw's are good, I'm just not sure that they are $9 good!